Lingua Franca is the first CD devoted to the music of David Feurzeig, whose compositions “test the boundaries between vernacular and concert music, seriousness and humor, and disparate musical traditions” [Dresdner Amtsblatt]. 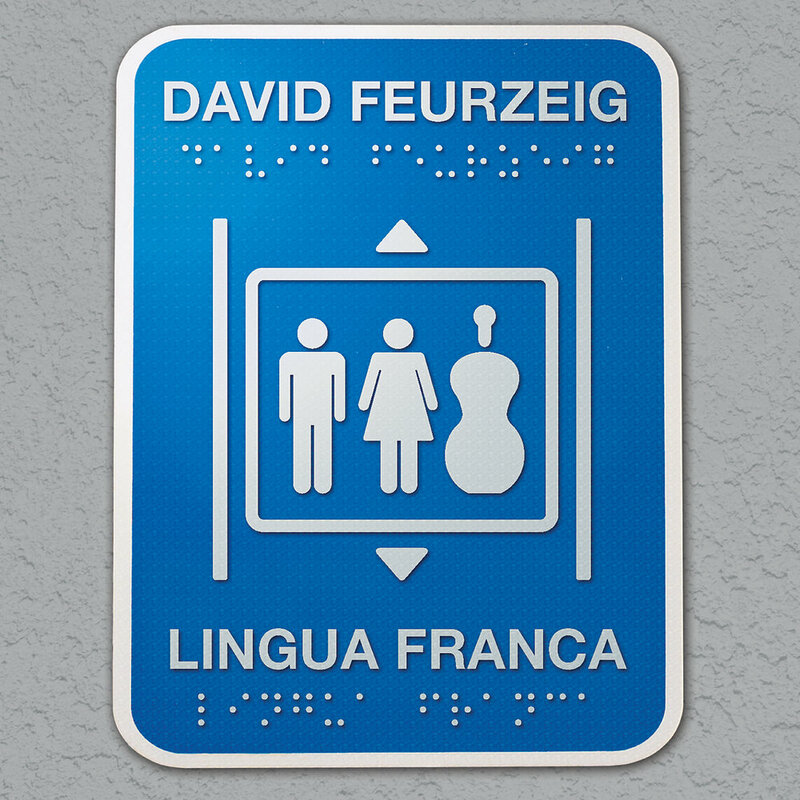 A lingua franca is any language or hybrid of several languages used as a common tongue—an apt description of Feurzeig’s music, which speaks in a unique personal synthesis made from elements of highly diverse styles. The entire album was recorded, mixed, and mastered by Grammy-winning producer and recording engineer Adam Abeshouse. The title piece, Lingua Franca, features the “world’s top-selling cello/bass duo” Low & Lower (Brooks Whitehouse and Paul Sharpe) in a virtuosic display as they play while reciting or singing five gems of International English—today’s lingua franca—which range from a Belgrade hotel elevator sign (“press a number of wishing floor”) to the instructions on a chopstick wrapper (“the traditional and typical of Chinese glonous history”). Feurzeig, a prizewinner of the of the World Championship Old-Time Piano Playing Contest, is the performer on the alternately poignant and hilarious Four Homages, which reimagine the work of great composer-pianists of the past in contemporary vernacular piano styles: from the Bartokian “Bela’s Blues” to “Stride Rite,” a 3-minute summary of the Rite of Spring in ragtime. The set concludes with a tribute to Martin Luther King, a quodlibet of “We Shall Overcome” and “Happy Birthday,” which is both a cri de coeur for our troubled times and somehow also a rollicking boogie-woogie celebration. The album begins and ends with pieces for unaccompanied solo string instrument. Whitehouse performs the majestic five-movement Sonata for Solo Cello, which extends the monumental tradition of the Benjamin Britten solo sonatas into the 21st century with innovative virtuoso techniques. These include a jazzy, all-pizzicato Corrente employing guitar-like hammer-ons and pull-offs, and a Prelude that features transcendental (and transcendentally difficult!) episodes in double-stop natural harmonics. Violist Daniel Panner, Naumburg winner and principal of the NYC Opera, plays the Sonata for Solo Viola, which likewise pushes the limits of the instrument, but always in the service of passionate expression. The music of David Feurzeig has been performed throughout the US and in Asia, New Zealand, and Europe, where his Songs of Love and Protest for double chorus were sung in Dresden’s Semper Opera House to celebrate the city’s 800th jubilee. He has been awarded the Silver Medal of the Royal Academy of Arts, a Beebe fellowship, an American Prize in choral composition, and grants from the American Composers Federation and Meet the Composer. As a pianist, he performs eclectic lecture-recitals featuring music from the classics to stride, jazz, and new music in illuminating juxtapositions. He is silver medalist of the 2001 World Championship Old-Time Piano Playing Contest and winner of the 2003 Best New Rag competition of the Old-Time Music Preservation Association (OM-PA). Feurzeig teaches composition and music theory at the University of Vermont. Brooks Whitehouse has performed and taught throughout the US and in Europe, Australia, and Asia. He has held Artist-in-Residence positions at the Tanglewood Music Center and the University of Virginia, and has soloed with orchestras throughout the US, including the Boston Pops and the New England Chamber Orchestra. Whitehouse has performed on tour and in recital at Carnegie Hall with the Garth Newel Piano Quartet and has recorded for Bridge Records and the Centaur, CRI, and Innova labels. He is currently Associate Professor of Cello at the University of North Carolina School for the Arts. Paul Sharpe has performed in recital and presented master classes at the International Double Bass Encounter (Brazil), Bass2008 (France), the World Bass Festival (Poland), the Cleveland Institute, the University of Iowa, the University of Michigan, the University of North Texas, and Interlochen Arts Academy. As a soloist, he has appeared with the Dallas Chamber Orchestra, the Aspen Young Artists Orchestra, and the orchestras of Anchorage, Theatro São Pedro (Porto Alegre, Brazil), Lubbock, and the Fairbanks Summer Arts Festival. He is a founding member of the eclectic bass quartet Bad Boys of Double Bass and Professor of Double Bass at the University of North Carolina School for the Arts. As Low and Lower, Whitehouse and Sharpe have been entertaining audiences since 2010 with a unique combination of artistry, virtuosity, and satire, featuring innovative works that incorporate vocalizing and storytelling. Daniel Panner has concertized extensively throughout the US and Israel with the Mendelssohn String Quartet, and received the 1998 Naumburg Chamber Music Award as a member of the Whitman Quartet. He has performed as a guest with the Juilliard, St. Lawrence, Daedelus, and Flux Quartets, and has served as principal violist of the NYC Opera and the Mostly Mozart Festival Orchestra. He has taught at the Juilliard School, the Mannes College of Music, Rutgers University, SUNY Stonybrook, and Queens College. An active performer of new music, he is a member of Sequitur and the Locrian Ensemble and has recorded for Naxos and Albany records, including solo viola works by Thea Musgrave and Victoria Bond. **World premiere recording of the entire work (track 13 previously-released).